As the central part of the face, our nose is also one of the most noticeable among our facial features. A deviated nose may give the impression of facial asymmetry, or a crooked nose may give an aura of ruggedness, while a drooping nose may add a little number to our age. Science has proven that nose shape is actually a physical adaptation by our ancestors from the geographical location they chose to thrive. Notice that people who are leaving in areas with extreme cold weather usually have flat faces and narrow noses while people from the middle east and African region usually have larger nose, and people from higher altitude regions, mostly Asians, commonly have flatter faces with flatter nose, while those commonly known as westerners or “White” usually have narrow, high nose as they experience both extremes in weather condition. Despite this known fact, most people still strive to change the shape of their nose, thus, a couple of nose surgery procedures in Thialand gained fame. The first documented successful cases of Nose Surgery dates back in the BC period in Ancient India where nose was reconstructed after it was removed from a man as punishment. Several other instances and techniques have been recorded but nose surgery procedure really reached the peak of its popularity after the introduction of silicone implants. In contemporary times, nose surgery in Thailand has evolved to include several techniques using other parts of the body to develop the aesthetic appearance of the nose. Though nose surgery still has its functional branch, recent cases of rhinoplasty are more inclined to the cosmetic branch. IS THERE AN IDEAL NOSE SHAPE? Science has an ideal nose proportion which surgeons consider as a guide in nose reconstruction, but there is no universal nose shape that will look good for everyone. Before a surgeon decides whether a nose surgery procedure is good for a patient or not, he needs to consider the existing facial features of the patient first for him to be able to visualize a nose shape that will be in harmony with the rest of the patient’s facial features. Prof. Somyos Kunachak, the head surgeon at Yoskarn Clinic, is a licensed ENT and Plastic Surgeon in Bangkok and he is one of the highly respected faculty members of one of the biggest medical school in Thailand. Being an ENT and a plastic surgeon, he is able to perform a combination of functional and cosmetic nose surgery procedures which most doctors and surgeons in Bangkok won’t be able to do. Understand however that there will be limitations as to the result we can achieve based from the current appearance of your nose and your genetic make up. Our clinic also boasts our personalized service to each and every one of our patients as we try understand the anxieties felt by patients who will be undergoing surgery especially in a different country. We also offer a full package of hotel, tour, and pick up service for all our patients who would like to come over from overseas. WHAT TECHNIQUES FOR NOSE SURGERY CAN WE OFFER? Our center offers a wide range of nose surgery procedures in Thailand such as nose augmentation, nose reduction, alar plasty, septoplasty, revision rhinoplasty, correction of deviated or crooked nose which also covers correction of nose deformity due to cleft lip or any nose deformity caused by accident or previous injury, and other more specialized rhinoplasty techniques such as osteotomy (bone reduction). Our surgeon will recommend a procedure and technique according to the needs of the patient based on personal assessment. Since he is also an EENT specialist, he also performs surgery to correct snoring problems and this can be combined with cosmetic nose surgery. It is also safer to have nose surgery especially open rhinoplasty, with an ENT specialist as they know how to manipulate the underlying structure of your nose without compromising your breathing. 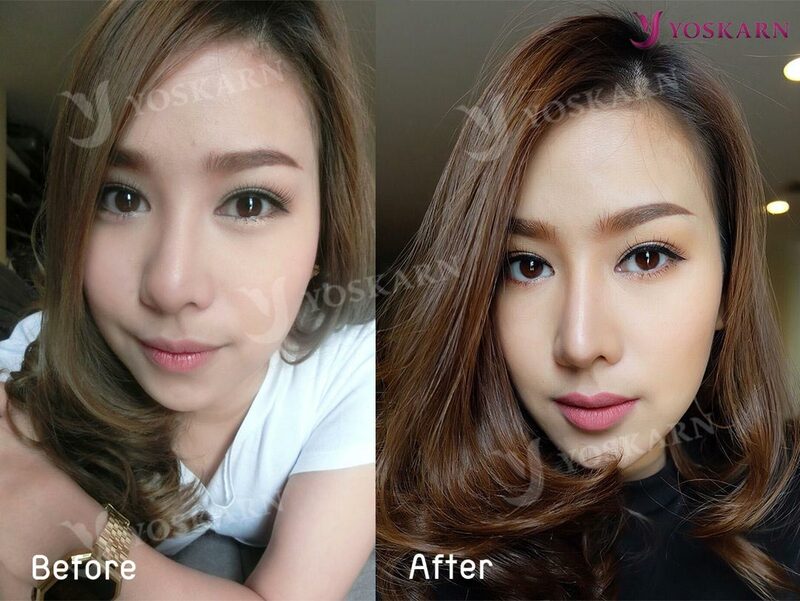 Yoskarn Clinic is also the go to center for patients who have had previous nose surgeries and are not happy with the result of their first one as our surgeon is one of the biggest names in rhinoplasty industry in Thailand and he specializes in revision rhinoplasties. Nose correction in Thailand, otherwise known as rhinoplasty, is a radical plastic surgery procedure that is used to correct aesthetic problems on the nose such as deviation, hooked nose, or a broken nose due to a previous accident.